The long slide toward summer in the Arctic is beginning earlier than ever this year, if we measure winter’s apex by the extent of the sea ice. March 7 marked the maximum reach of the ice this year, as tracked by the National Snow and Ice Data Center. New York Times climate writer Andrew Revkin reports that 2011 is tied with 1979 for the lowest maximum ice ever recorded. While this is disturbing news for the health of the Arctic ecosystem and its wildlife — especially polar bears, whose declining litter size has been linked by scientists to diminishing sea ice — it opens up unusual new opportunities for northern explorers. We’ve assumed for decades that the Age of Exploration is over — in terms of finding new geography to discover, or chances to be the first humans to enter a particular realm. While there are pockets on the planet to be sure, it’s rare that a whole new tract of terrain opens up for charting. 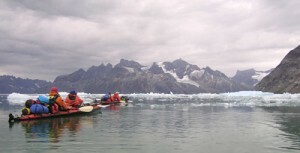 But that’s been the case recently in Greenland’s Kangerdlussuaq region, as melting ice has allowed access to this far-north fjordland never before accessible to sea kayakers. Historically, this area between the Blosseville Coast south of Scoresbysund and the Ammassalik region at 65 degrees north has been off limits due to a lethal combination of icebergs and strong currents – and many ships that dared to challenge these waters were either forced back or wrecked. Now, however, lighter pack ice that is breaking up earlier and more fully has changed that scenario. Last summer, Natural Habitat Expeditions CEO Olaf Malver, along with Icelandic adventurer Sigurdur Jonsson, ventured safely into this area by kayak for the first time. And now Natural Habitat Expeditions is making this exceptional Arctic odyssey available to expert kayakers on our first commercial exploratory trip this summer. Discover Greenland’s Forbidden Coast as we sail from Isafjordur, Iceland across the Denmark Strait to the eastern shore of Greenland, to kayak among a dazzling array of icebergs, fjords, glaciers and marine life. Nothing slakes an explorer’s thirst for adrenaline like being a pioneer — here’s your chance! The 16-day expedition — for expert kayakers only — happens July 29 – August 16.